Mangos are tropical fruits that are not only juicy, flavorful, and pretty to look at but are also good for your health. They're high in vitamins, minerals, and antioxidants. Years ago, they were hard to find and considered exotic, but these days mangos are readily available year round. 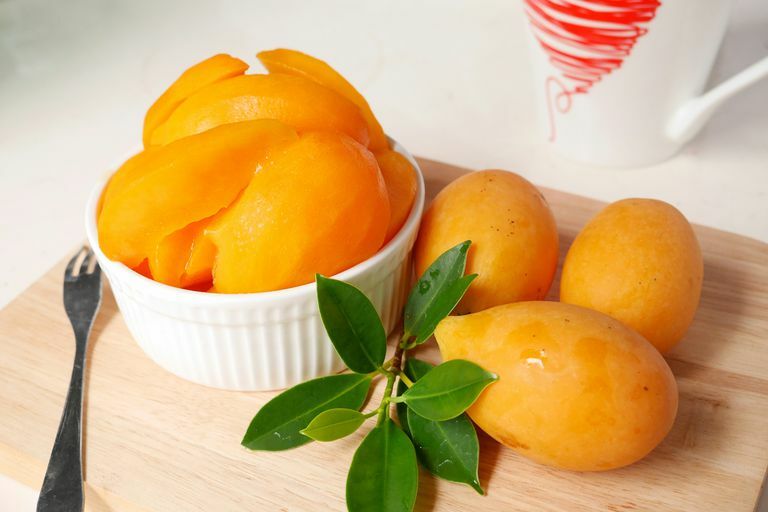 One cup of mango slices has about 100 calories, almost no fat, and 25 grams of carbohydrates. It's also almost sodium free and has about 3 grams of fiber. Mangos are high in vitamins, potassium, and folate and also add fiber to your diet. Fiber is essential for a healthy digestive system and helps keep you feeling full between meals. It also slows down the absorption of sugar after you eat. Mangos are high in vitamin C. In fact, one mango has all the vitamin C you need for a whole day. Vitamin C is essential for immune system function, strong connective tissue, and healthy blood vessel walls. Getting an insufficient amount of vitamin C every day can lead to bruising and make it difficult for wounds to heal properly. Mango is also high in potassium and has almost no sodium, so eating mango may help regulate blood pressure and body fluid balance. Mangos also boast high levels of folate and vitamin A.
Folate is a B-complex vitamin that is important for heart health and production of blood cells. Vitamin A is needed for normal vision, healthy skin, reproductive health, and normal cell development. Mangos also contain quercetin, mangiferin, and norathyriol, which are all potential antioxidant compounds. Antioxidants help protect your body's cells from damage from free radicals (which experts believe cause cancer, atherosclerosis, and other diseases). Although not many people choose to eat mango skin, it is edible. If you want to give it a try, depending on the mango, you might find that it tastes slightly bitter, chewy, and possibly tough. On the nutrition side, however, it's filled with various antioxidants and fiber. Note that it also contains urushiol, the same compound that causes reactions to poison ivy, so if you're sensitive be cautious about consuming mango skin. A mango has one large seed on the inside which makes it a little tricky to cut the fruit. Serve fresh mangos as a snack with a little yogurt dip, scatter mango pieces over a salad at lunch, make into a topping for a main course, or serve them with a little-whipped cream and chopped nuts for a sweet dessert. Frozen mango chunks are perfect for fruit smoothies. They go well with other tropical fruits like bananas and pineapples or blend them with plain low-fat yogurt and almond milk. National Nutrient Database for Standard Reference Release 28. United States Department of Agriculture& Agricultural Research Service.